I love coming up with cute birthday themes for the boys. 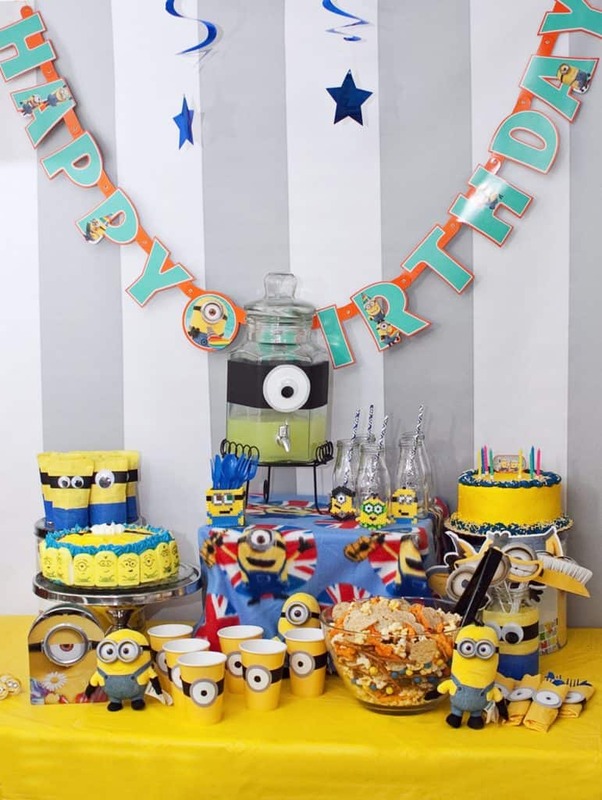 Growing up, my mom always come up with unique party ideas for my birthday parties, including Olympic and Halloween parties. I use these fond memories as my inspiration when I am planning parties for my boys. 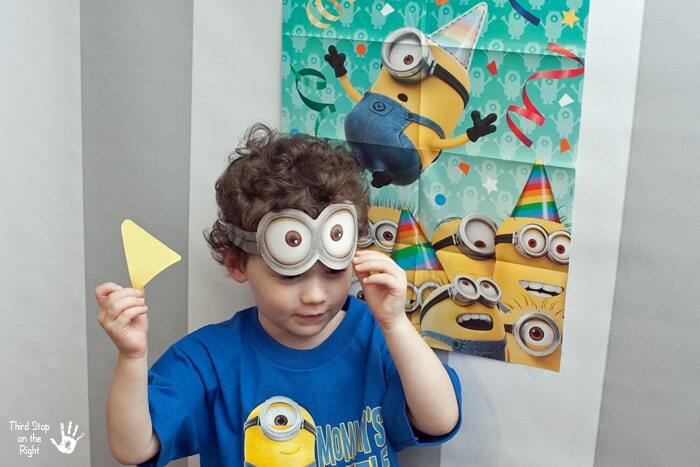 Little E came to me recently and asked me for a minion-themed birthday party. 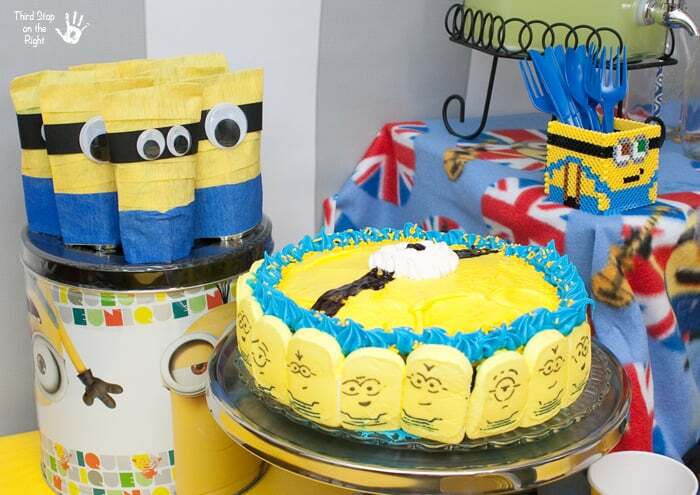 I knew that this would be a theme that I could have a lot of fun with — plus who doesn’t love those adorable minions? Since Minions © 2015 Universal Studios. All rights reserved. was just released last week on December 8, we started by picking up a Blu-Ray/DVD MetalPak copy of the movie at our local Target. This case is really cute since it shows the minion in the tie-dyed shirt with a flower on the front. Since we were already at Target we decided to pick up some party essentials. 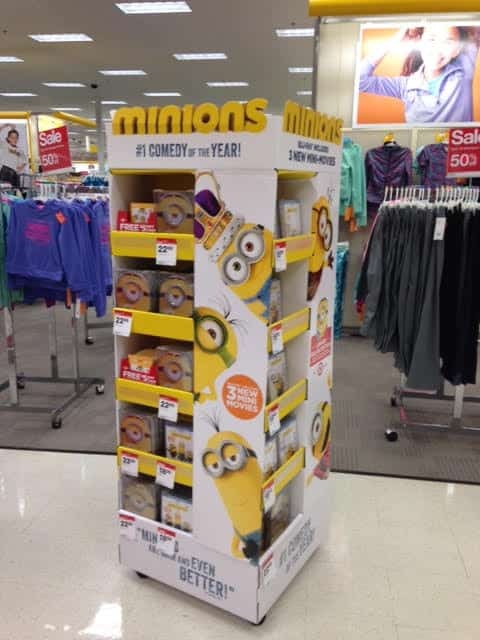 Target has a huge selection of minion party favors, banners and posters, party games, and even masks and party candles. 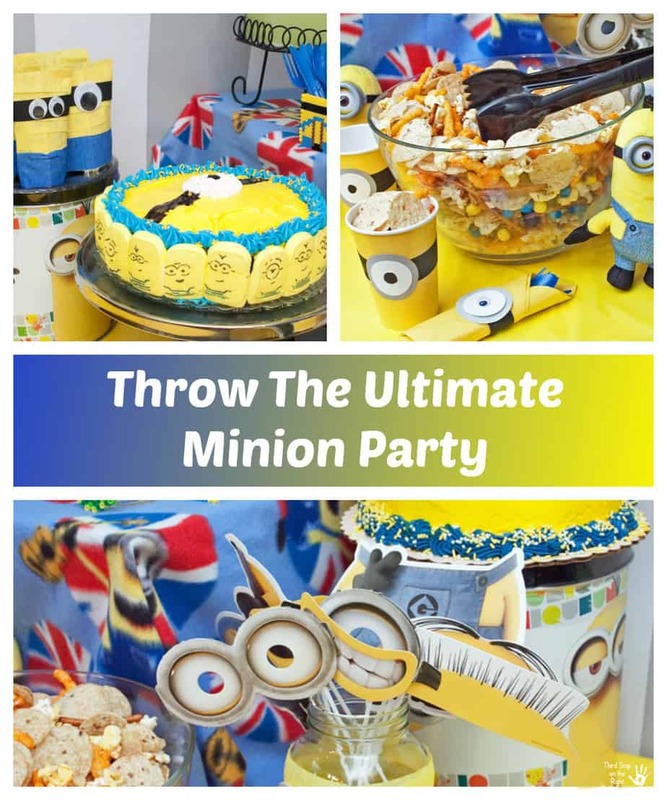 It really is a one-stop-shop when you are planning a minion party! 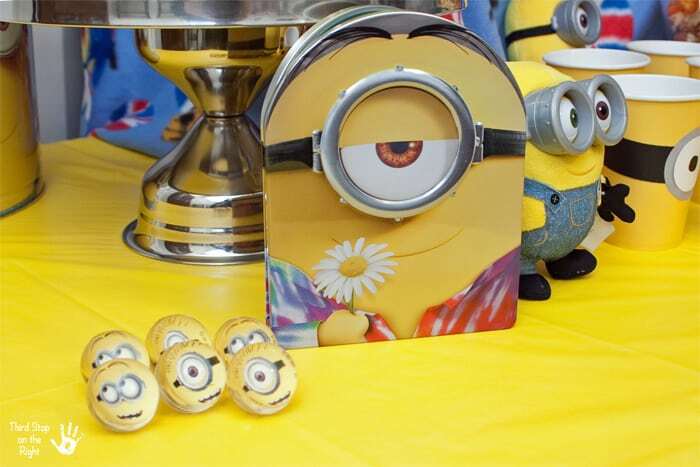 For the drink station, I decided to get creative with my drink dispenser and used some construction paper and a large googly eye to decorate it as a minion. I put some yellow lemonade in the dispenser so that it really looked like a large minion. I also used the construction paper and googly eyes to make silverware and napkin wrappers as well as decorating the snack mix cups. Of course, every birthday party needs a cake. 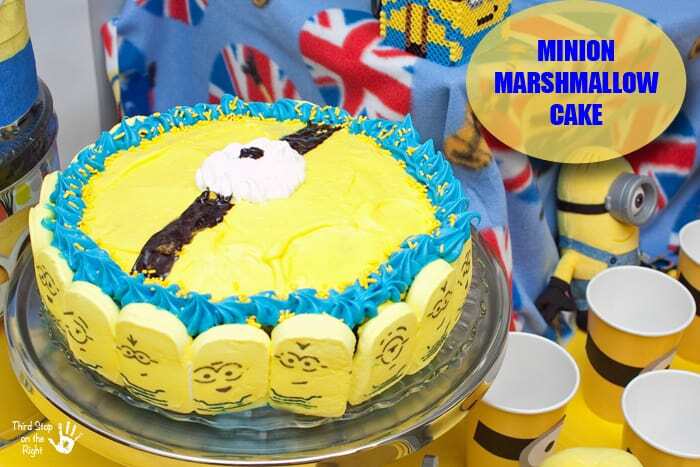 While I was at the store I saw these Minion-shaped marshmallow treats and knew that they would be perfect for making a cake with. I also picked up a package of blue cake batter, yellow cake batter, blue icing, yellow icing, and sprinkles. 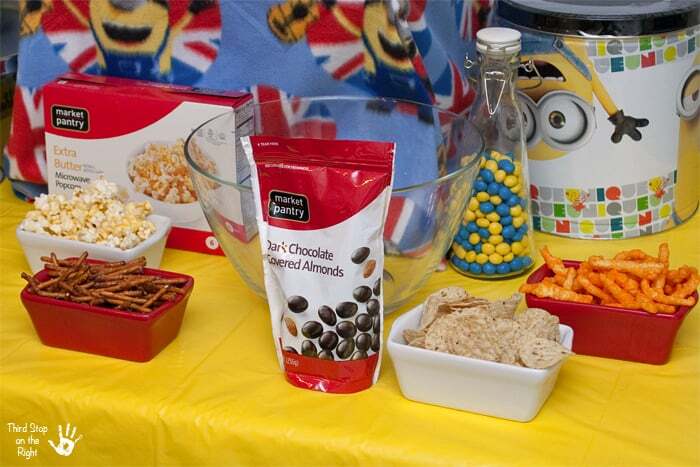 Another party snack that I decided to make with some of the snacks that I bought at Target was a minion-themed snack mix. While I was at Target I purchased some pretzel sticks, tortilla chips, cheese puffs, Market Pantry popcorn, Market Pantry chocolate-covered almonds, and blue and yellow chocolate candies. 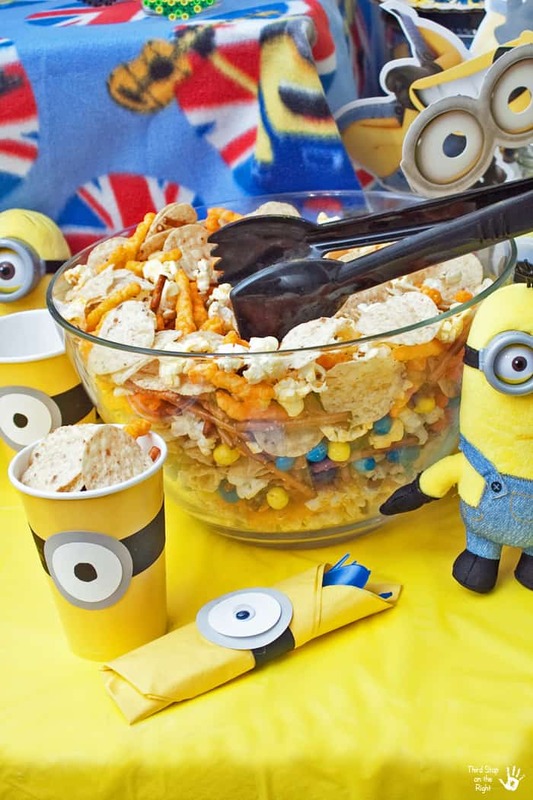 I mixed all of the ingredients into a large bowl and placed some cups decorated like minions on the table. 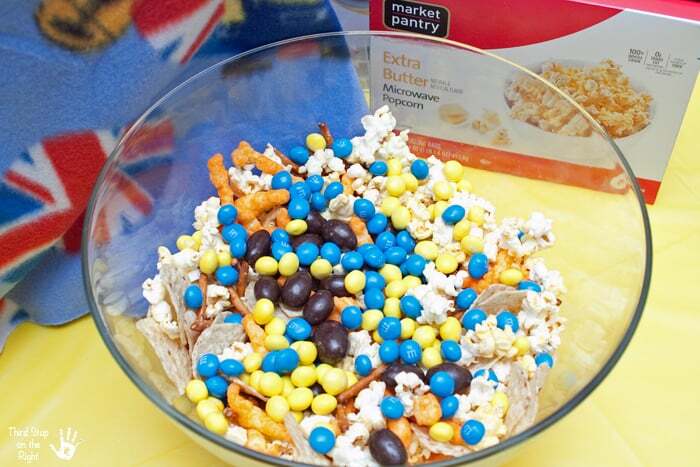 Now the kids can scoop some of the party mix into the bowl and much on it while they play at the party. Speaking of playing, I set up a few games at the party including a minion photo booth, complete with mix-and-match minion hair, goggles, bodies, and mouths. The kids had a blast coming up with different dress-up combinations. They kept trying to see which one of them had the silliest look. 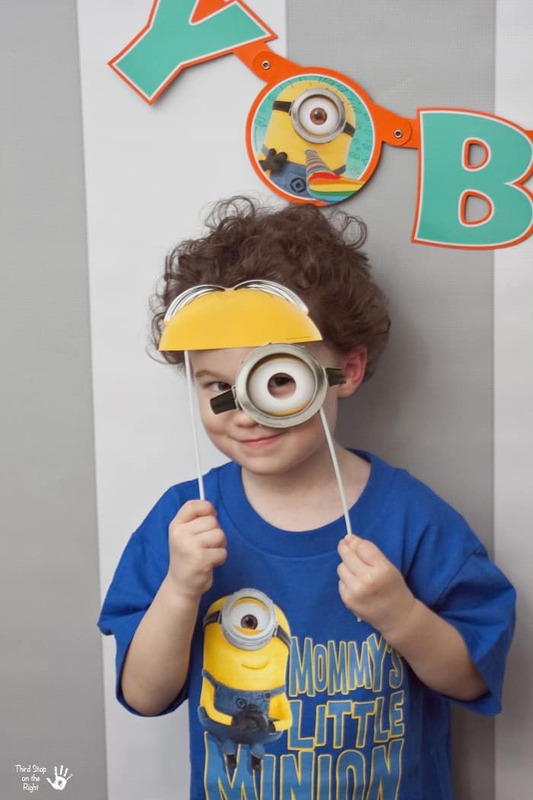 We also did a pin-the-party-hat-on-the-minion game. The boys were blindfolded with some minion “goggles” and then had to try and put the party hat on the minion. 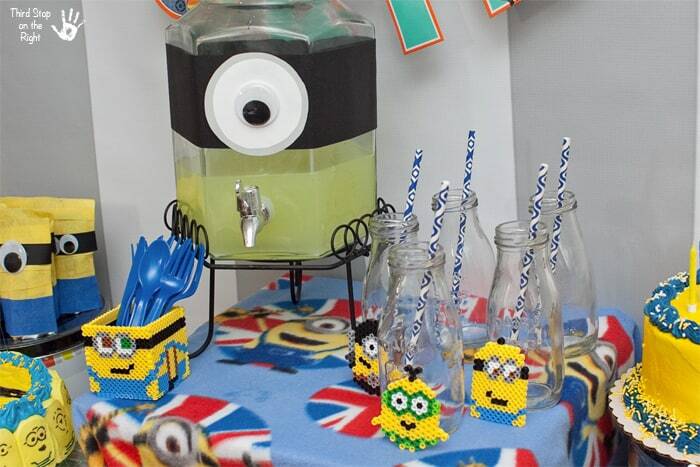 I also came up with some minion crafts, because it wouldn’t be a party thrown by me unless we had crafts! 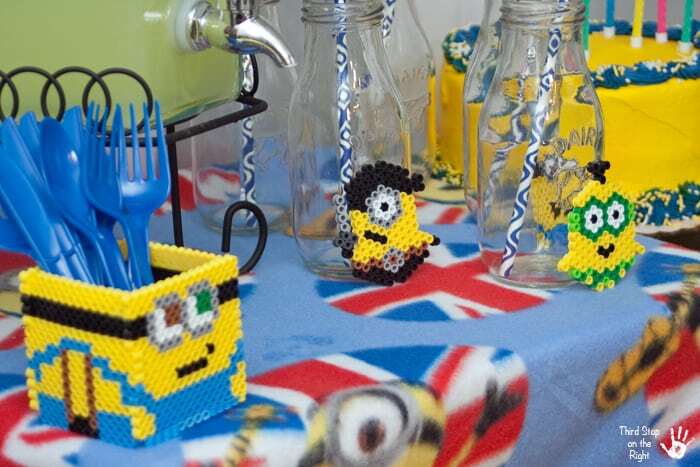 I found some minion melty bead patterns so I had the boys make some minion decorations. These are so cute for drink coasters, or even as cup identifiers. I even make a box-shaped holder to hold the silverware. Needless to say that the boys were thrilled to be able to put these in their treat bags! I wanted another cute item for the boys to take home so I made streamer-wrapped juice pouches to put in the treat bags. These are also really easy to make and something that the kids will love. 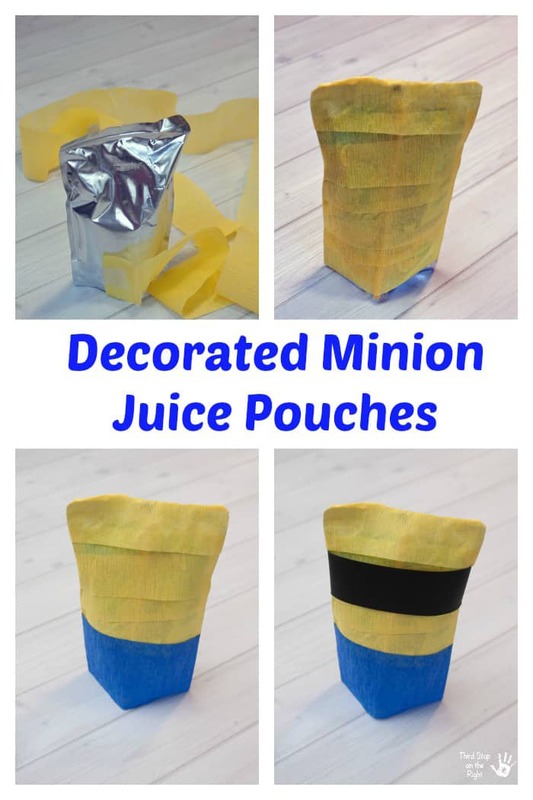 All you have to do is take a juice pouch (you could even use a juice box) and wrap the entire pouch in a piece of yellow streamer. The wrap the bottom third of the pouch in a blue streamer. I then attached a black band and either one or two googly eyes to make the goggles. They make for a great decoration and also something that the kids will love taking home. The boys had a blast with this birthday party — almost as much as I enjoyed creating it. The only problem is that it turned out so well I am going to have trouble topping it in the future! 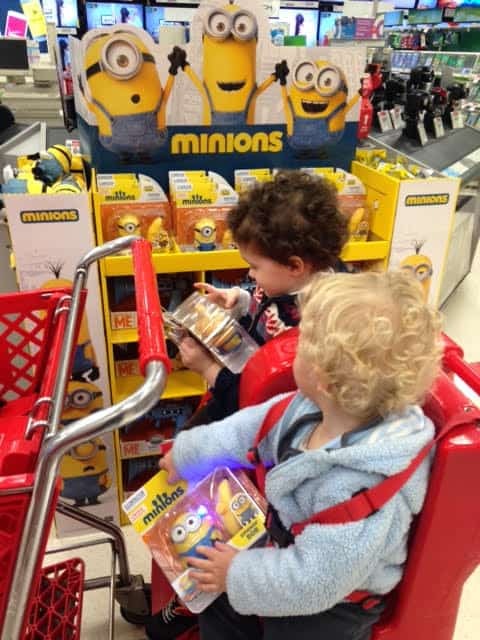 You can pick up your own copy of the Minions movie (created by Illumination Entertainment) which includes three Minions mini movies at Target. In fact, the Minions MetalPak Blu-ray/DVD Deluxe is exclusively available at Target and includes 40 minutes of Target Exclusive content. Just look for the special movie displays throughout the store, or in the DVD department. While you are there, you can also pick up any party supplies, toys, or apparel that you need. 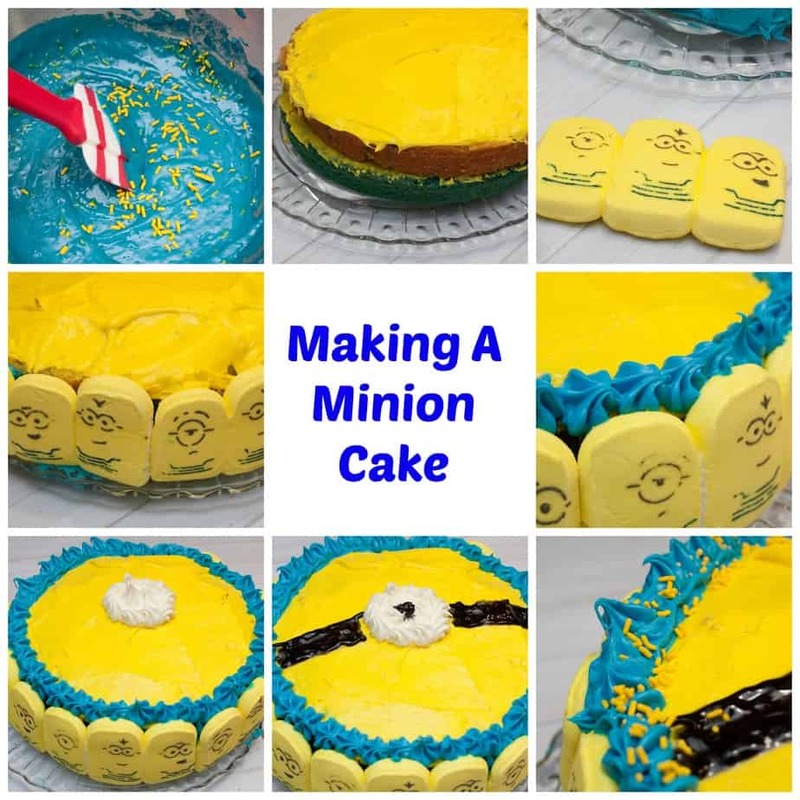 Comment On: Check out some of these other Minion movie crafts and recipes. 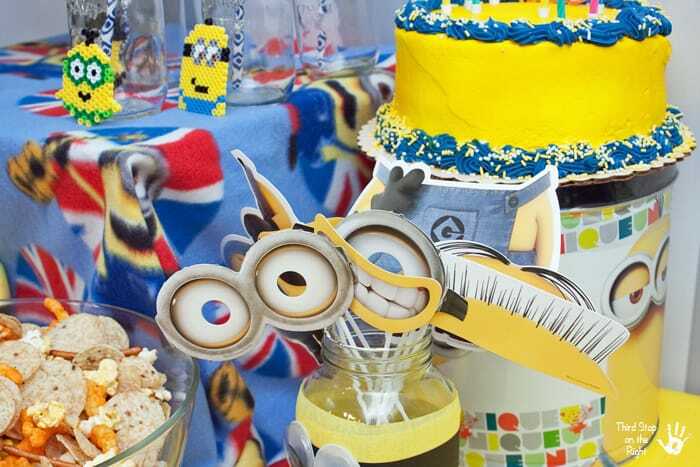 Plus, tell me what was your favorite party of my minion-themed birthday party?